Chestnut: Kobayashi beat me in May contest and "set a fire underneath me"
NEW YORK (CNN) -- Reigning hot dog-guzzling champ Joey Chestnut and nemesis Takeru Kobayashi of Japan attempted to psych each other out Thursday at the weigh-in for the 94th annual Nathan's Famous Fourth of July International Hot Dog-Eating Contest. 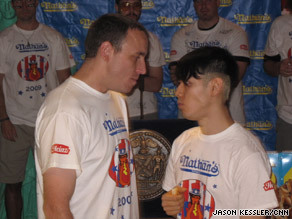 Competitive eaters Joey Chestnut and Takeru Kobayashi take part in an official "staredown." Chestnut and Kobayashi glared long and menacingly into each other's eyes in an official "staredown." At last year's contest, 25-year-old Chestnut, a civil engineering student at San Jose State University, eked out a win over Kobayashi, 31, in a tiebreaker after both initially consumed 59 dogs apiece. It was Chestnut's second slim victory over Kobayashi in as many years. Kobayashi vowed he will avenge those two defeats on Saturday. He also said he no longer suffers from the "jawthritis" that some cited as the culprit for his 2007 defeat, which snapped his six-year winning streak at Coney Island. Chestnut, for his part, said he had no intention of ceding the coveted mustard yellow belt -- competitive eating's answer to golf's green jacket. He is setting his sights this year on 68 hot dogs in 10 minutes. Saturday's competition will be partially about redemption for Chestnut, too. In May, he suffered a stinging defeat to Kobayashi in a loss he said "really set a fire underneath me" and "made me hungry for this contest." Chestnut revealed the extreme dietary regimen he is following in the days leading up to the contest. He said he is sticking to water to make sure he is "empty" when the mountain of hot dogs is placed in front of him. In addition to Chestnut, Kobayashi admitted to keeping a watchful eye on 32-year-old Tim "Eater X" Janus, whose signature painted face was described by Major League Eating impresario Richard Shea as an attempt to mask his "inner torment." In a recent trial round, Janus downed a personal-best 55 hot dogs -- a weiner's throw from the 59 that Chestnut and Kobayashi wolfed down last year. As a lead-in to the main event, Major League Eating on Friday will hold a first-of-its-kind "cross-species" eating contest between three competitive eaters and three Asian elephants. MLE's Shea described it as the realization of one of his two lifelong dreams, the other being a scenario in which a dozen competitive eaters eat the entire contents of a convenience store. Twenty finalists will compete in the championship on Saturday. They were culled from 18 preliminary contests and comprise a Who's Who of the world of competitive eating. For people who stuff their faces with record-breaking quantities of food, many of the contestants at the weigh-in boasted surprisingly svelte physiques. Juliet Lee, a 44-year-old Maryland salon owner fresh off the feat of downing 13.23 pounds of cranberry sauce in 8 minutes, clocked in at a mere 105 pounds. Kobayashi, at 123 pounds, lifted his T-shirt to reveal the sort of chiseled abdomen one would expect at a bodybuilding competition. Others contestants were not quite as disconcertingly trim. Fearsome world matzo ball-eating champion Eric "Badlands" Booker tips the scales at 400 pounds.